For the Scarling. song, see Crispin Glover (song). 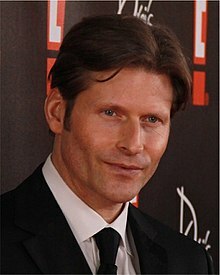 Crispin Hellion Glover (born April 20, 1964) is an American actor and director. Glover is known for portraying eccentric characters on screen, such as George McFly in Back to the Future, Layne in River's Edge, unfriendly recluse Rubin Farr in Rubin and Ed, mentally ill Cousin Dell in David Lynch's Wild at Heart, Andy Warhol in The Doors, the Thin Man in Charlie's Angels and its sequel, Willard Stiles in the Willard remake, Bobby McBurney in What's Eating Gilbert Grape, Ilosovic Stayne/The Knave of Hearts in Alice in Wonderland, Phil Wedmaier in Hot Tub Time Machine, and 6 in 9. He is also the voice of Fifi in the Open Season franchise and appeared in the screen adaptation of the Elmore Leonard novel Freaky Deaky. He played a German-speaking clairvoyant during World War I in the Polish-language film Hiszpanka, and an unwitting employee in service of Robert De Niro's character in The Bag Man. In the late 1980s, Glover started his company, Volcanic Eruptions, which publishes his books and also serves as the production company for Glover's films, such as What Is It? and It Is Fine! Everything Is Fine. He currently stars in the Starz television series American Gods as Mr. World, the god of globalization. Glover was recognized for his directorial work in 2013 when the Museum of Arts and Design in New York City staged the series It Is Crispin Hellion Glover. The program consisted of screenings of all of his directorial work, live performances, and speaking engagements. Glover is an only child, born in New York City, and moved to Los Angeles with his family at the age of five. He is the son of actor Bruce Glover and actress and dancer Mary Elizabeth Lillian Betty Krachey (née Bloom Koerber), who retired upon his birth. He was named after the Saint Crispin's Day speech from William Shakespeare's play Henry V, which his parents enjoyed. "Hellion", his real middle name, had earlier been used as a false middle name by his father, who did not like his own real Germanic middle name, Herbert. Glover's father is of English and Swedish descent, while his mother has Czech and German ancestry. As a child, Glover attended the Mirman School from first grade through ninth grade. He then attended both Venice High for tenth and eleventh grade, and Beverly Hills High School for twelfth grade; he graduated in 1982. Glover began acting professionally at the age of 13. He appeared in several sitcoms as a teenager, including Happy Days and Family Ties. His first film role was in 1983's My Tutor. That led to roles in Teachers (1984) and Friday the 13th: The Final Chapter (1984). He then worked with director Trent Harris on the third chapter of the Beaver Trilogy, entitled The Orkly Kid. In this short film, he portrayed a small-town man who organizes a local talent show to showcase his obsession with Olivia Newton-John, much to the embarrassment of the local community. At the climax of the film, Glover does his rendition, in full drag, of Newton-John's "Please Don't Keep Me Waiting" from her 1979 album Totally Hot. His breakout role was as George McFly in Robert Zemeckis's Back to the Future, an international box office success in 1985; his character was the father of Marty McFly, despite being three years younger than Michael J. Fox in real life. Glover and the producers could not agree on suitable terms for him to appear in the sequels, so the role was greatly reduced and recast. In Back to the Future Part II, Zemeckis reused brief footage of Glover which had been filmed for the first film. Glover was billed as "George McFly in footage from Back to the Future" in the closing credits. The older footage was combined with new footage of actor Jeffrey Weissman wearing a false chin, nose and cheekbones, and various obfuscating methods – in the background, wearing sunglasses, rear shot, upside down – to play George McFly. Because these methods suggested that Glover himself had performed for the film, he sued the producers on the grounds that they had used his likeness without permission, as well as not having paid him for the reuse of the footage from the original film. As a result of this suit, there are now clauses in the Screen Actors Guild collective bargaining agreements which state that producers and actors are not allowed to use such methods to reproduce the likeness of other actors. He has continued to play exceedingly eccentric types, including playing Andy Warhol in Oliver Stone's The Doors in 1991, as well as the title characters in Bartleby (2001) and Willard (2003). He received mainstream attention as the "Thin Man" in the Charlie's Angels films; the character had initially been cast as a speaking role, but Glover, noting that the lines as written were exposition, convinced the producers to eliminate the lines to create a precise image for the character. Glover was a co-interlocutor with Norm Hill and Werner Herzog for the special feature commentary for the DVD of Werner Herzog's Even Dwarfs Started Small and Fata Morgana. Glover appeared in the 2007 film Beowulf as the monster Grendel, playing the part through performance capture technology. The film was Glover's first collaboration with director Robert Zemeckis since the original Back to the Future film. He voiced the character "6" in the film 9. Glover played Ilosovic Stayne / The Knave of Hearts in Tim Burton's Alice in Wonderland. He played the one-armed bellman in Hot Tub Time Machine, and the unwitting employee of Robert De Niro's character in The Bag Man. In 1989, during a hiatus from films, Glover released an album titled The Big Problem Does Not Equal the Solution, The Solution Equals Let It Be through Restless Records, produced by Barnes & Barnes (of "Fish Heads" fame). The album features original songs such as "Clowny Clown Clown", odd versions of Lee Hazlewood's "These Boots Are Made for Walkin'", and Charles Manson's "I'll Never Say Never to Always" (sung in falsetto), and readings from his art books Rat Catching and Oak Mot. Sample pages from these books are featured in the album's liner notes. Glover recorded a version of the Michael Jackson song "Ben" to coincide with the release of his 2003 film Willard; the song had been written for the sequel to the original 1971 version of the film. In the music video for the song, he sings to a rat named Ben. A number of songs using Glover's name as the title have been recorded by various artists, including shoegaze/gothic rock band Scarling., Chicago outsider musician Wesley Willis and a New Jersey-based band called Children in Adult Jails. Glover has written between 15 and 20 books. Oak-Mot and Rat Catching are featured prominently during his Big Slide Show presentation, and are presented as visual art as much as written art. He constructs the books by reusing old novels and other publications which have fallen into the public domain due to their age (for example, Rat Catching was constructed from an 1896 book Studies in the Art of Rat Catching, and Oak-Mot was constructed from an 1868 novel of the same title). He rearranges text, blacks out certain standing passages, and adds his own prose (and sometimes images) into the margins and elsewhere, thus creating an entirely new story. Four of his books have been published so far, through his publishing company, Volcanic Eruptions. Other known titles include The Backward Swing, A New World, and Round My House. * The publishing years listed above may not represent first-edition publication dates, but subsequent available editions. Glover made his directorial debut with 2005's What Is It?, a surreal film featuring a cast of actors with Down syndrome. It premiered at the 2005 Sundance Film Festival. With a budget of only $150,000, it took almost a decade to complete, and was originally intended to be a short film. Most of the primary footage was shot in 12 days, stretched over a two-and-a-half-year period. Production was mostly funded by Glover's roles in Willard and the Charlie's Angels films. Glover's second film, It Is Fine! Everything Is Fine., was written by Utah writer and actor Steven C. Stewart. Stewart was born with severe cerebral palsy and had been confined to a nursing home for about 10 years. The film is a fantastical psychosexual retelling of life from Stewart's point of view. It premiered at the 2007 Sundance Film Festival. Glover has completed shooting his third feature film as a director, which he developed as a vehicle for his father Bruce Glover and himself to act together. This film is not part three of the It? trilogy. Glover has residences in Los Angeles and the Czech Republic. His residence (45 minutes east of Prague by train) Zámek Konárovice, is a 17th-century 20-acre (8.1 ha) chateau that is recognized as historically significant by the Czech government. The property requires constant upkeep and restoration; according to Glover, "[The property] is a lifetime project that will be in continuous flux and repair for hundreds of years from now, as it has been the hundreds of years before I 'owned' it." From 2002 until 2003, Glover was dating Alexa Lauren, a Penthouse magazine Pet of the Month for September 1999. Glover appeared on Late Night with David Letterman on July 28, 1987, to promote River's Edge. Unbeknownst to David Letterman and the audience, Glover appeared in character as "Rubin" from the then-unreleased film Rubin and Ed, wearing platform shoes and a wig. Rather than a conventional interview, Glover staged an Andy Kaufman-like prank. After being goaded by a woman in the audience (who some argue had been planted), Glover stated he "knew that this was gonna happen" and "the press, they can do things, they can twist things around." After challenging Letterman to an arm-wrestling match, Glover delivered an impromptu karate kick a few feet from Letterman while stating, "I'm strong... I can kick!" Letterman then abruptly ended the segment by walking off stage, saying, "I'm going to check on the Top 10," as the program cut to commercial. The subsequent confusion and controversy surrounding his appearance was compounded by the fact that Rubin and Ed was not actually released until 1991. However, the film had been in development since before Back to the Future – Glover had actually already devised Rubin's "look" by 1985. Glover has since refused to go into detail about the reasons for his behavior on the show, other than to mention that he was flattered that fans are still speculating on the performance more than 20 years later. He also stated that he prefers there to be an "air of mystery" about the appearance. In an interview in 2011, Back to the Future co-star Michael J. Fox talked about the incident with Letterman, saying, "Crispin isn't crazy, just excitable." 1981 The Best of Times Crispin Episode: "Pilot"
1982 The Facts of Life Cadet No. 1 Episode: "The Big Fight"
Happy Days Roach Episode: "Vocational Education"
Hill Street Blues Space Cadet Episode: "Honk If You're a Goose"
1993 Hotel Room Danny Episode: "Blackout"
2010 Funny or Die Presents Thomas Edison Episode: "105"
^ "Masterclash Takes on Male Friendships With 'Old Friends' and Crispin Glover". Asylum.com. Retrieved September 25, 2010. ^ "It Is Crispin Hellion Glover". Museum of Arts and Design. Retrieved August 5, 2015. ^ Meier, Allison. "Crispin Glover hates the ending of "Back to the Future"". Salon.com. Retrieved August 5, 2015. ^ Meier, Allison. "Crispin Glover Tackles Hollywood Taboos". Hyperallergic.com. Retrieved August 5, 2015. ^ "Crispin Glover Interview". Index Magazine. Retrieved July 14, 2009. ^ "Spin-Uncut". Angelfire.com. Retrieved July 14, 2009. ^ "What is it? Good question". 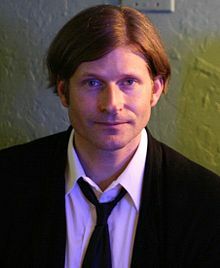 ^ "Actor/Filmmaker Crispin Glover". Reddit. ^ "The History of Crispin Glover's Bizarre Debut Album | Nerdist". Nerdist. 2017-09-20. Retrieved 2018-02-05. ^ Glover, Crispin (February 2011). "Crispin Glover on Back to the Future 2". Kermode & Mayo (Interview). Interviewed by Simon Mayo, Mark Kermode. London: BBC Radio 5 Live. Retrieved April 11, 2011 – via YouTube. ^ Ate Isti (June 27, 2003). "Charlie's Angels: Full Throttle (2003)". Internet Movie Database. Retrieved March 10, 2016. ^ a b c "CrispinGloverInfo.com Bizarre Interview". Archived from the original on October 11, 2007. ^ "Not a jaunt down the Yellow Brick Road". The Daily Utah Chronicle. February 28, 2005. Archived from the original on June 2, 2014. Retrieved August 31, 2006. ^ "An Update on Crispin Hellion Glover's Eagerly Anticipated It Is Mine". MovieWeb. February 18, 2010. Retrieved December 11, 2010. ^ La Carmina (February 15, 2011). "Crispin Glover Talks Prague, Castles, Absinthe And Film". The Huffington Post. Retrieved March 24, 2016. ^ "Crispin Glover Goes Back to the Crazy – Top 10 Disastrous Letterman Interviews". Time. February 13, 2009. Retrieved July 14, 2009. ^ Mooney, Chris. "Letters to the Editor: The Glover's off". Salon.com. Archived from the original on April 21, 2009. Retrieved July 14, 2009. ^ Andy Baio (July 10, 2009). "Transcript of Crispin Glover on Letterman". Waxy.org. Retrieved July 14, 2009. ^ "Crispin Glover on David Letterman," interviewed by Frank Hyoguchi.. Retrieved December 24, 2009. ^ "Crispin Glover: Not Of This World". Rolling Stone. Retrieved 2018-02-05. ^ McNary, Dave. "Film News Roundup: Crispin Glover, Ronen Rubinstein to Star in Horror Movie 'Smiley Face Killers'". Variety.com. Retrieved 7 October 2017. Wikimedia Commons has media related to Crispin Glover.